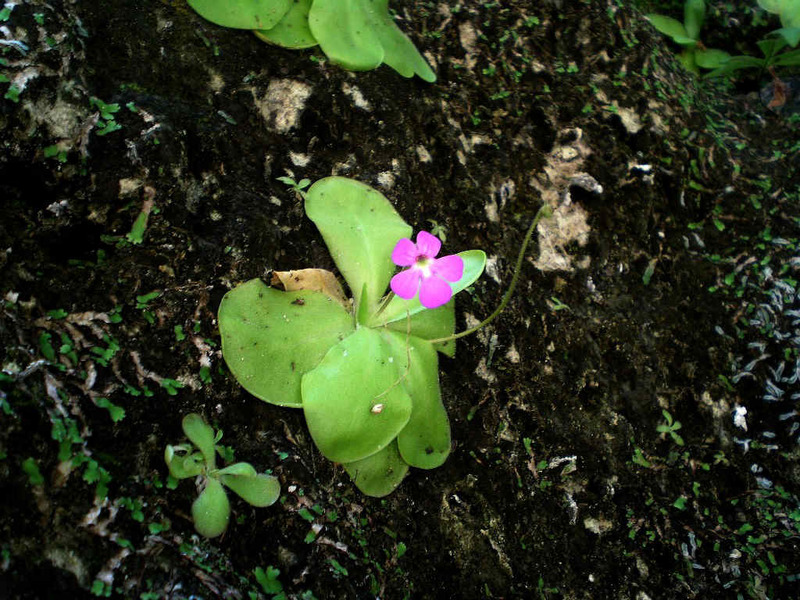 On my way to the USA for a work meeting, I decided to stop by Mexico for the weekend of July 29-30 and meet up with my good friend Ruben Resendiz for another Pinguicula expedition. Noah Elhardt & Forbes Conrad were still traveling around Mexico and joined up with us too. They picked me up at the Mexico City airport on Friday night (28th) and we drove north for a few hours, stopping only at around 3am. 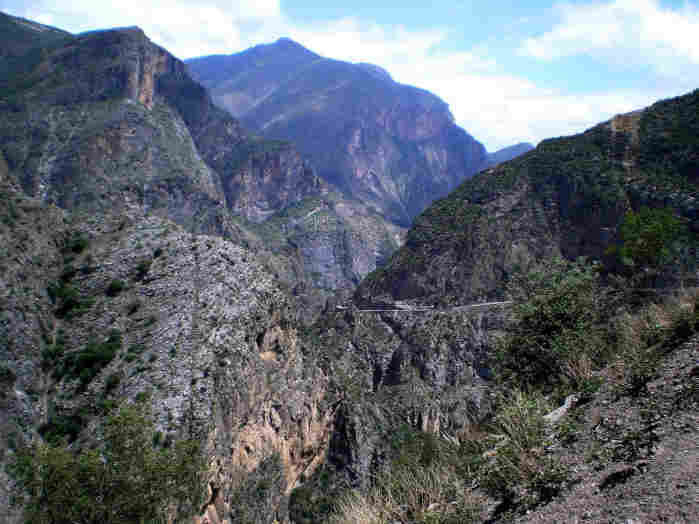 We were up on Saturday at 8am and headed towards Zimapan, in Hidalgo state. 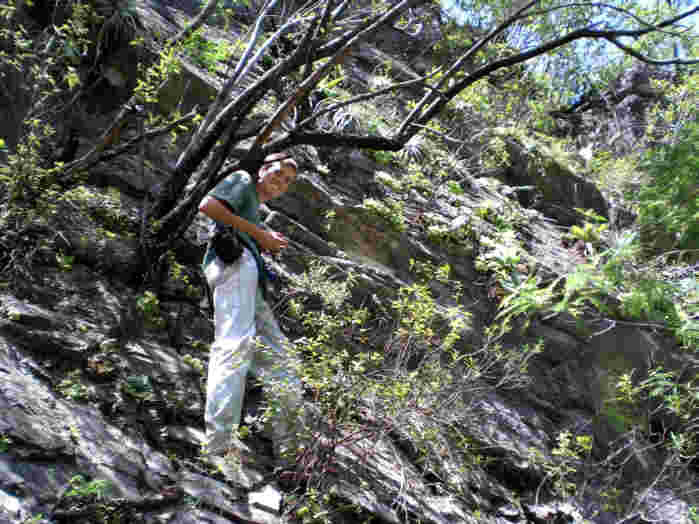 Ruben & I had studied maps & Google Earth extensively, searching for the best possible routes to explore the Moctezuma Canyon and attempt once again to find P.elizabethiae & P.moctezumae. 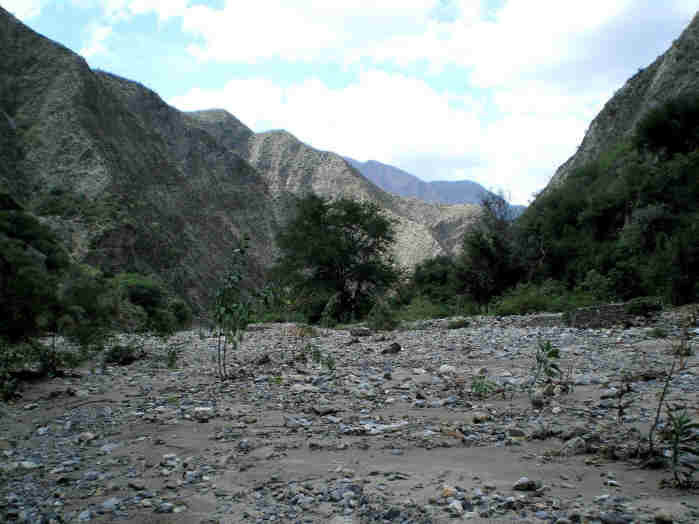 Among numerous possible routes, we decided to search for a dirt road that appeared to lead towards the Toliman Canyon (which runs roughly parallel to the Moctezuma Canyon for several kilometers, until both canyons meet further north near La Mora). 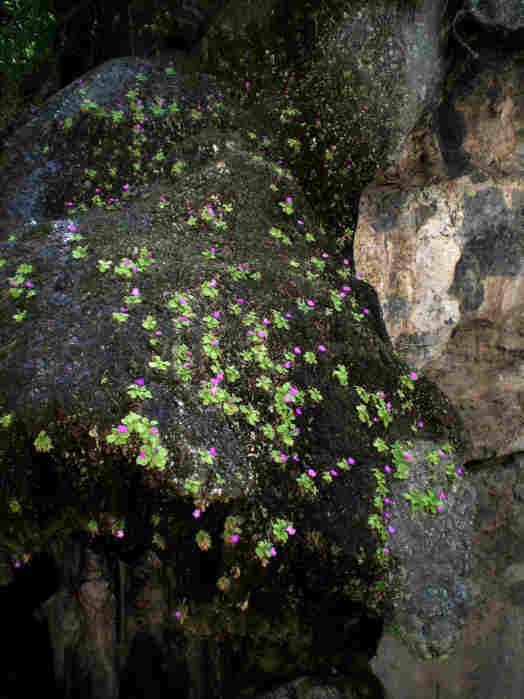 The Toliman Canyon is the type location for P.agnata, but P.elizabethiae is also known to grow there (and we hoped P.moctezumae would be present too). Short Stretch of Moctezuma Canyon where P.moctezumae grows. Toliman Canyon and road leading down into it. We found the desired dirt road without much trouble and to our surprise it not only took us TO the Toliman Canyon but it led us right down INTO it! In a few short kilometers the road zigzagged dizzyingly several hundred meters down the steep canyon walls to a mine at the bottom. 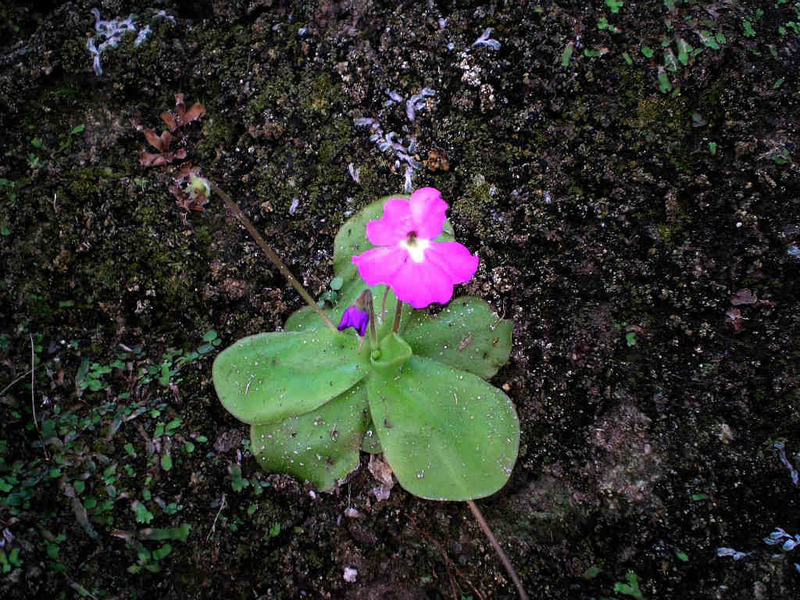 It was along this road that we saw our first Pinguicula: P.agnata. 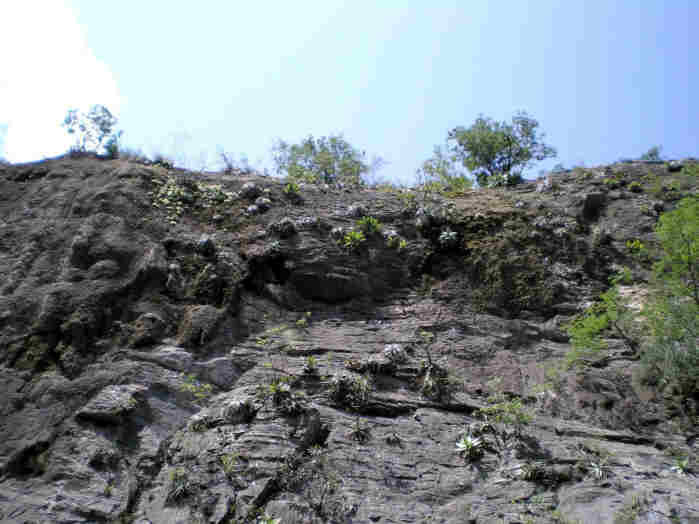 We found two sites, where the yellow rosettes stood out clearly on the vertical north-facing cliffs. Could one of these two sites be the actual type location of P.agnata? The first location was a huge vertical cliff at around 1620m altitude, where we didn’t even try to reach the plants, since they were so high up. At this site, I recognized a phenomenon I’d seen before and which is a good indicator of Pinguicula in dry deserts of Mexico: large water-holding Vriesia bromeliads. 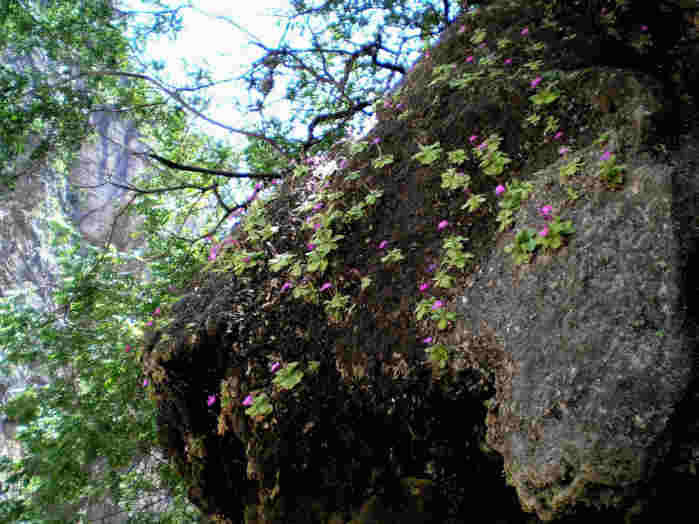 I’m used to seeing these in rainforest as epiphytes back in Brazil, not in deserts! Thus wherever these bromeliads were spotted in the desertic Toliman Canyon was an indication of a more humid habitat – actually an almost certain guarantee that the cliff was north-facing, no compass was necessary. 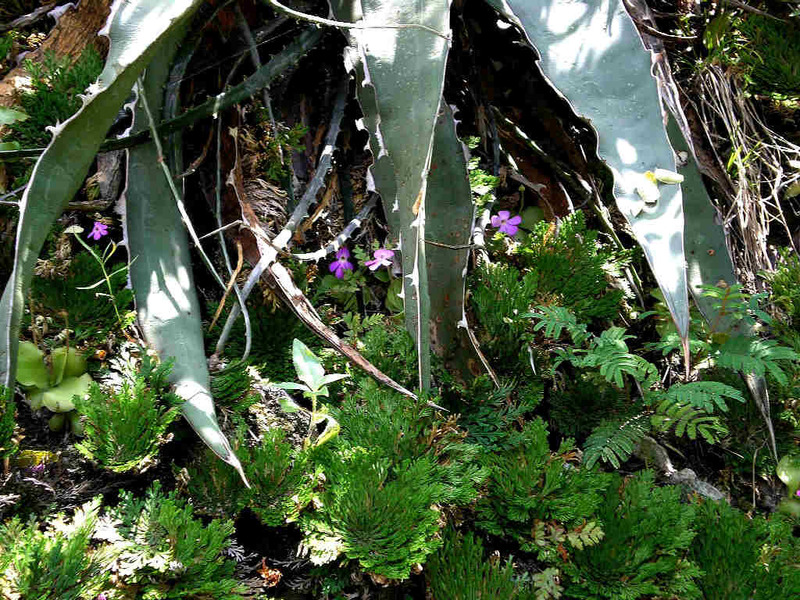 The second P.agnata site was at around 1540m altitude. 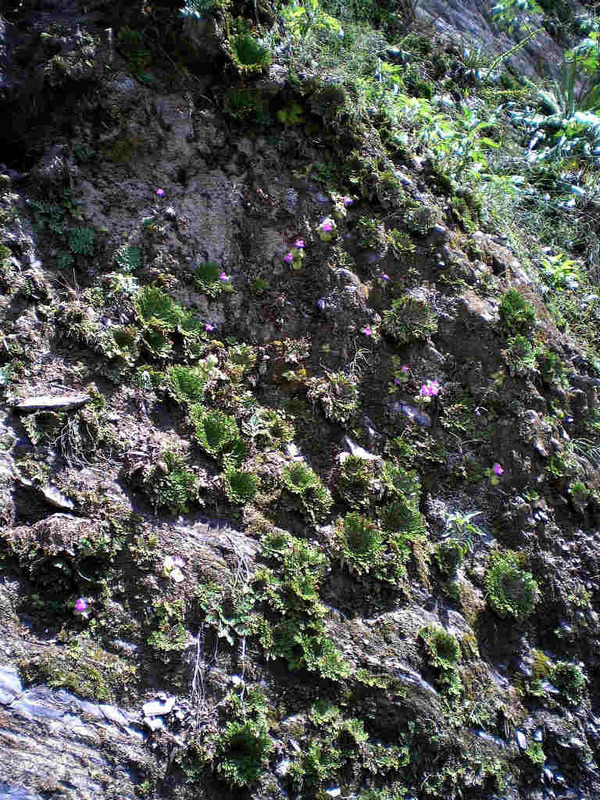 Numerous plants grew along north-facing walls of a small canyon by the road, a relatively humid habitat (especially if you compare to the extremely dry P.agnata habitat we found nearby two weeks before!). There were several plants with flowers within reach at this site, and many more higher above. 2nd P.agnata habitat with bromeliads (see P.agnata on upper left). Noah at 2nd P.agnata habitat. 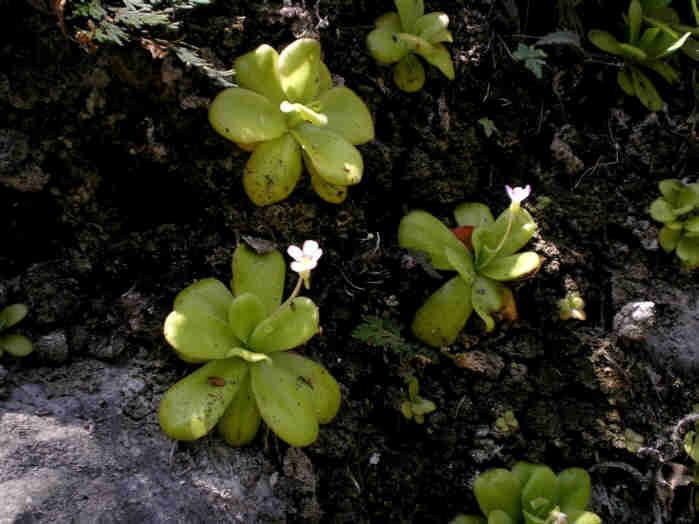 P.agnata in a relatively humid habitat. 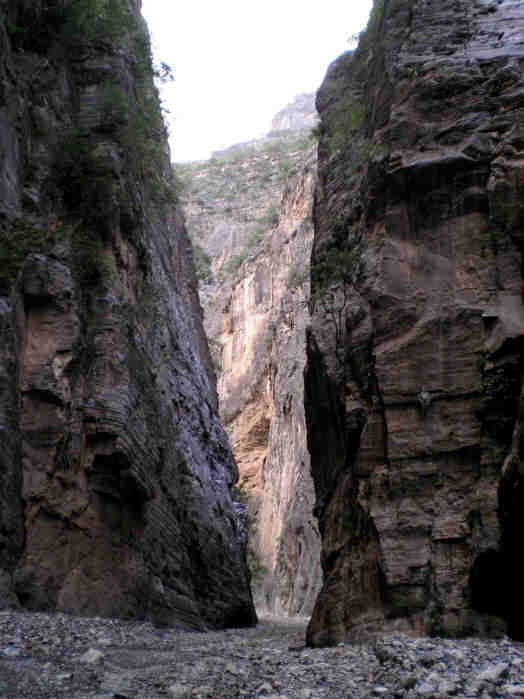 Narrow section of Toliman Canyon. Wide section of Toliman Canyon. Less than a kilometer after we got out of the car and began hiking down the Toliman Canyon, we were blessed with the sight of one of the local holy grails: P.elizabethiae! 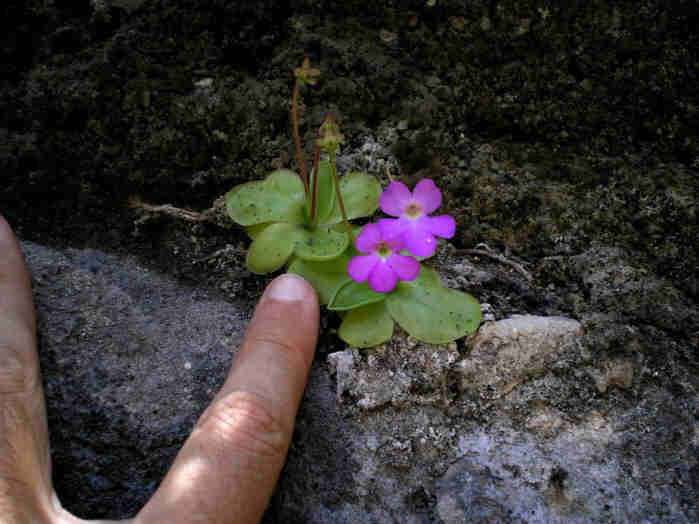 A small group of around 10 plants were growing just out of reach on a calcareous seep of a north-facing wall of the canyon, at around 1180m altitude. And there were flowers too! We rejoiced loudly while taking numerous pictures. Our first impression was that the rosettes were smaller than in most Pinguicula species. 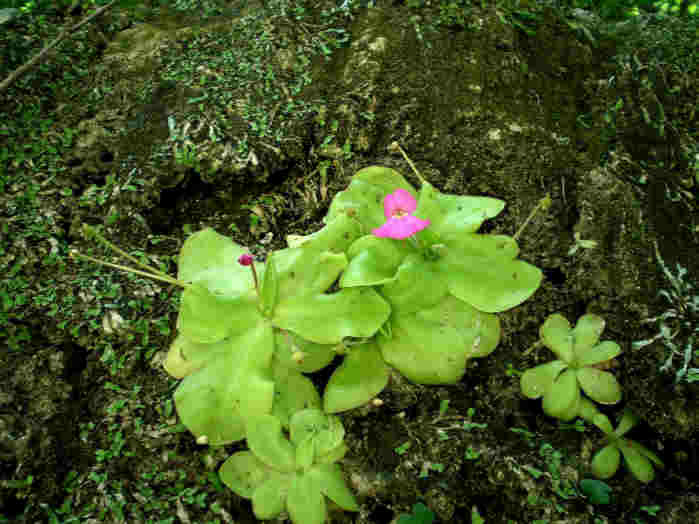 Relatively small rosettes of Pinguicula elizabethiae. Straight and curved spurs of P elizabethiae. Just a little further downriver we found a second population with 30-40 P.elizabethiae, growing among agave & other plants on nearly vertical north-facing walls. 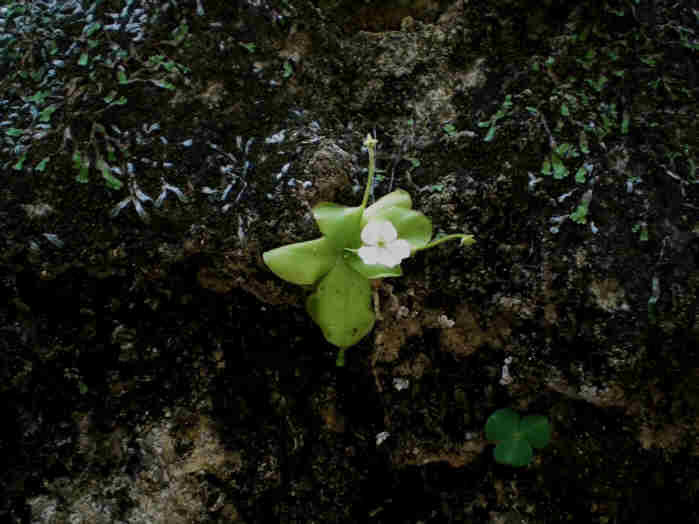 We quickly clambered up the hillside and soon found ourselves all standing side-by-side a few meters above the canyon floor, crowded on a narrow ledge by the rosettes of P.elizabethiae taking turns photographing them. Our second impression: the flower scapes were relatively very short and the spurs very long – sometimes they were even of equal length! In fact some of the flower scapes were reddish, apparently in the less shaded specimens. And the spurs were curiously sometimes straight and sometimes curved backwards. The short scapes may be an adaptation to vertical habitats, so that shed seeds won’t fall to the ground. Other species with longer scapes that grow on vertical cliffs often bend their inflorescences backwards towards the rocks after pollination. During that day I forgot to pay attention to this with P.elizabethiae, but looking at my pictures later, it seems like the scapes were somewhat bent backwards when in fruit in some plants, but not in others. Nearly 2km further downriver we found a huge population with hundreds or thousands of P.elizabethiae curiously growing next to an also large population of P.agnata. The two species didn’t exactly mix and we saw nothing that resembled hybrids. Both species were growing on wet to humid north-facing banks at around 1160m altitude. P.elizabethiae covered an interesting calcareous stalactite-like formation, which gave us some beautiful shots! 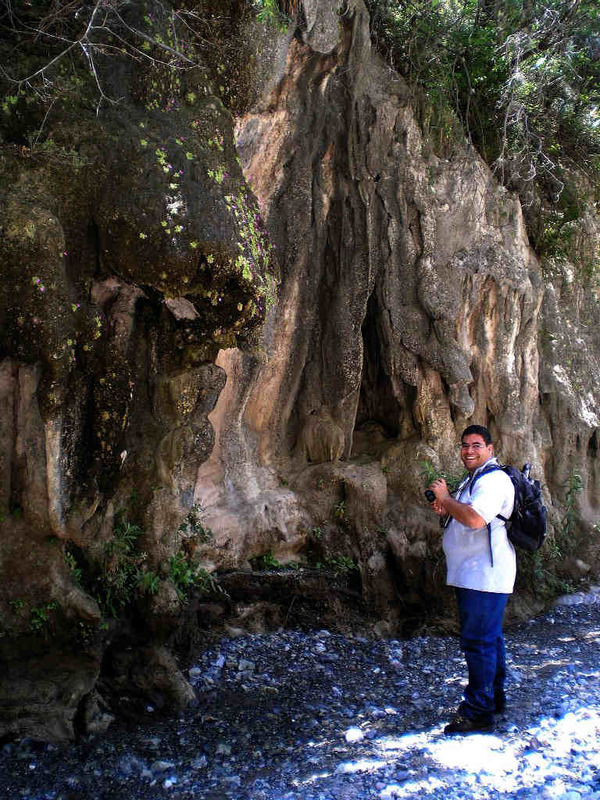 Ruben at 3rd P.elizabethiae site. 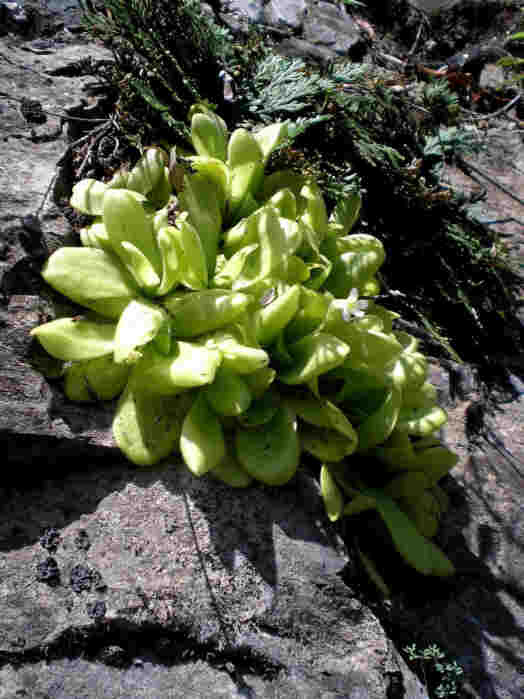 Numerous flowers and even spent seed capsules were present on P.elizabethiae (no scapes on P.agnata in this location), often with three scapes per plant. Supposedly P.elizabethiae begins flowering in July, but considering the spent inflorescences observed we think the plants had been in flower for over a month, maybe two. 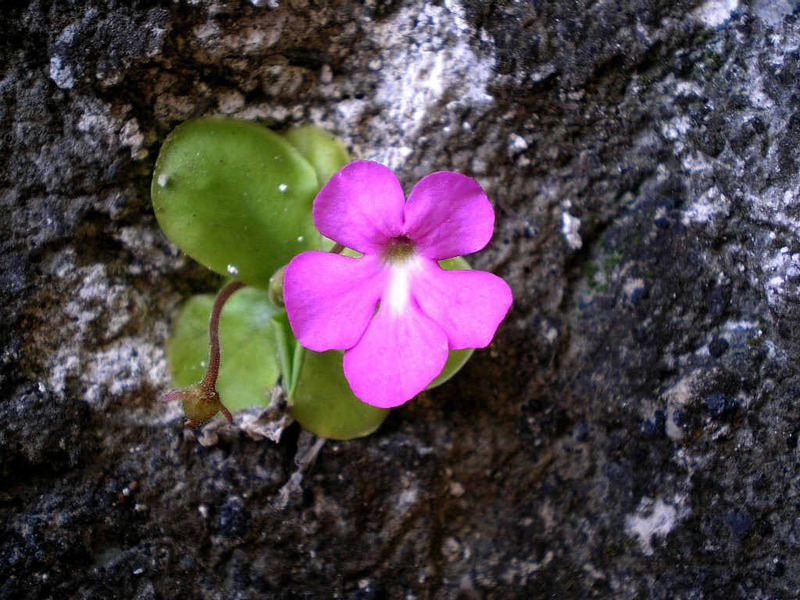 The flowers of P.elizabethiae were surprisingly similar to those of P.moctezumae in shape and color. Could it be convergent evolution to benefit from the same pollinator or does this show a possible close relationship between these two species? The flowers were mostly pink, with a white patch around the throat (most often only on the lower lip) and the inner part of the throat was greenish. But there were also purple flowers and we even found lilac flowers and a single very light-pink, nearly white, flower. The petal shape & size also varied quite a bit. Common flower form of P.elizabethiae. Light pink flower form of P.elizabethiae. Small flower form of P.elizabethiae. Large flower form of P.elizabethiae. Large wavy flower form of P.elizabethiae. Lilac flower form of P.elizabethiae. 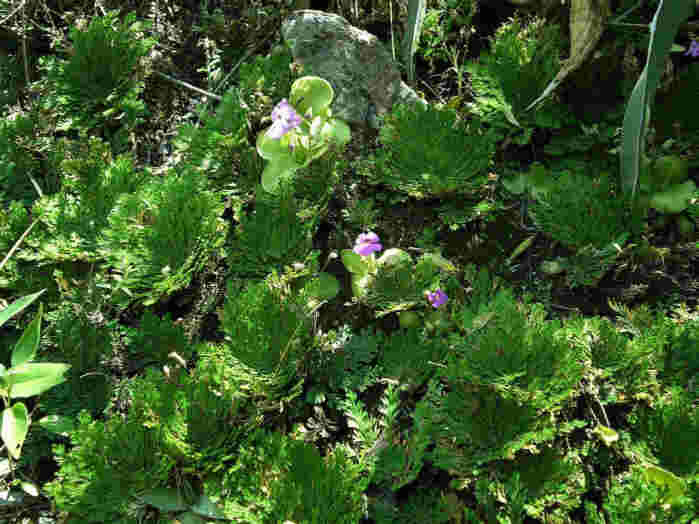 A few kilometers further downriver, where the canyon walls became mountain slopes, we found another nice population with maybe 150-200 P.elizabethiae growing among Selaginella lepidophylla at around 1100m altitde (again, facing north). This was a very different habitat in comparison to the previous three seen. 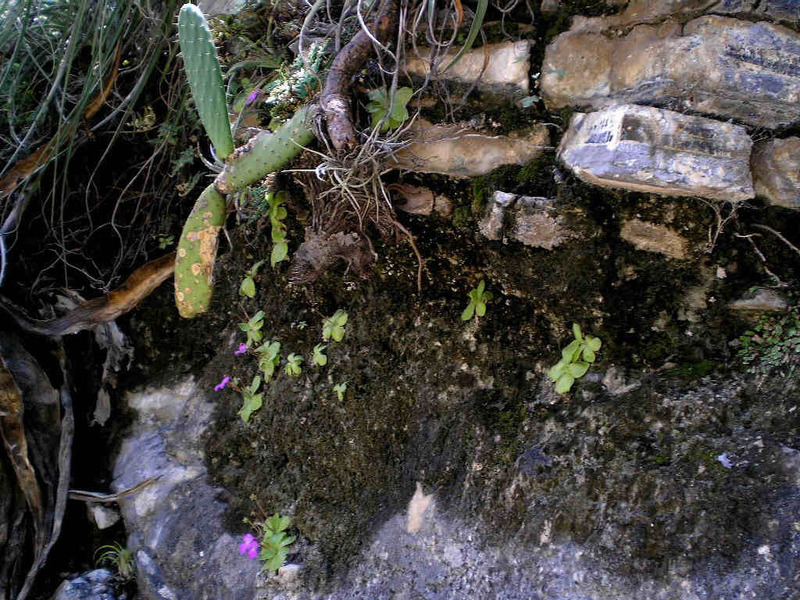 The hilly landscape with xerophytic vegetation growing in barely-humid soil mixed with rocks was very similar to the general area of La Mora, where P.elizabethiae has also been collected (but where others – including me – were not able to find it in the past few years). Pinguicula elizabethiae growing with healthy Selaginella lepidophylla together in habitat. The 5th (and last) population we found of P.elizabethiae was nearly 8km down the canyon from where we’d left the car. 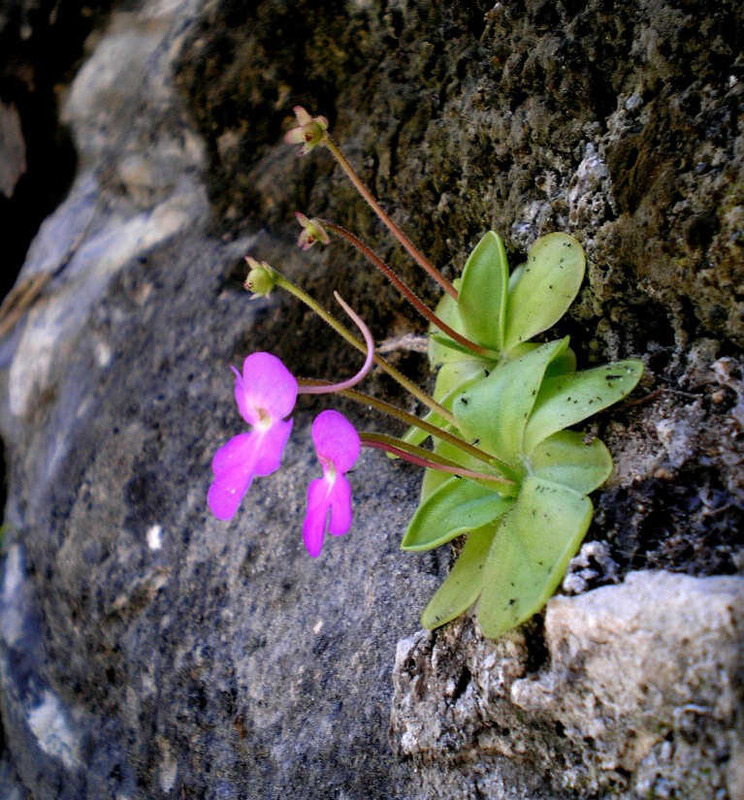 There were around 50 plants growing on north-facing canyon walls, at around 1030m altitude, once again neighboring a P.agnata population. 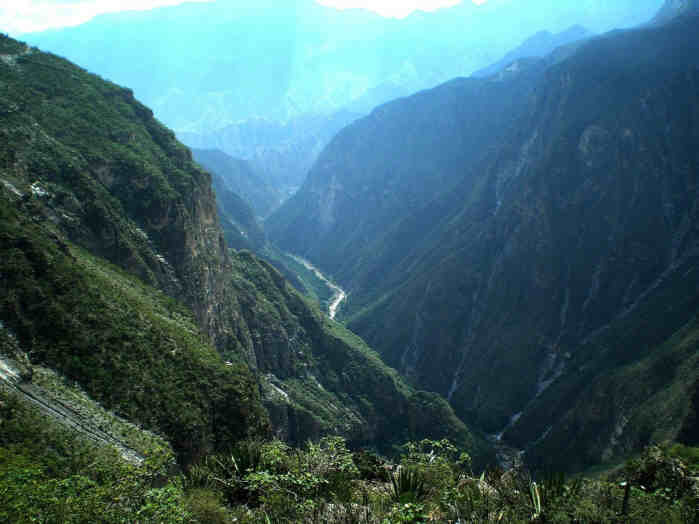 We were hoping to reach the junction between the Toliman and Moctezuma Canyons, and then head up the latter in hopes of finding P.moctezumae. But it was too far, we were too tired, and our feet were destroyed. So yes, we did not find P.moctezumae in the Toliman Canyon on Saturday, unfortunately. Analyzing in more depth maps and herbarium data during this past weekend, I realized that P.moctezumae is only known from a stretch of a few kilometers of the Moctezuma Canyon, in maybe 2-4 populations. 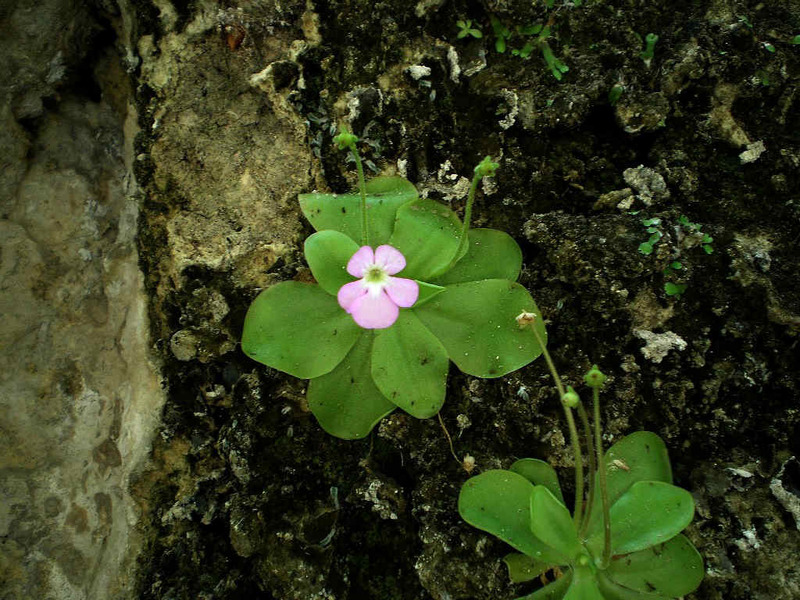 It’s hard to believe any species is such a narrow endemic, but if P.moctezumae is truly restricted to this tiny habitat, then it is in critical danger of extinction – especially if the canyon is flooded by the construction of a hydroelectric dam downriver, as has been rumored. 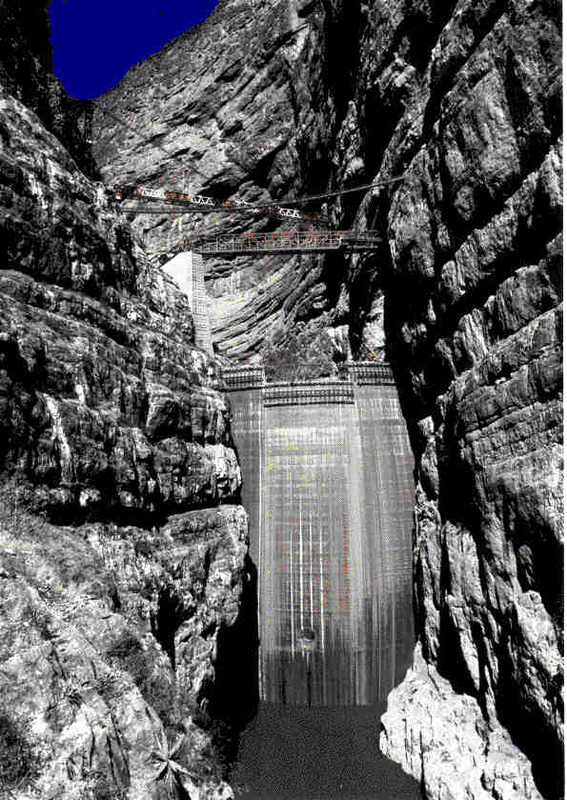 An hydroelectric dam along a canyon in Mexico. A real theat for P. moctezumae. We still had time on Sunday morning for yet another attempt to find P.moctezumae and we decided to explore another road we’d found on Google Earth. This dirt road came from the west, in Queretaro state, and eventually led us parallel to the canyon, yet on slopes nearly 1000m above it. We had a fantastic view of the Moctezuma Canyon, right above the areas where P.moctezumae was collected – but unfortunately had no time to attempt descending into it. This was extremely frustrating of course, being so close and yet so far from P.moctezumae! 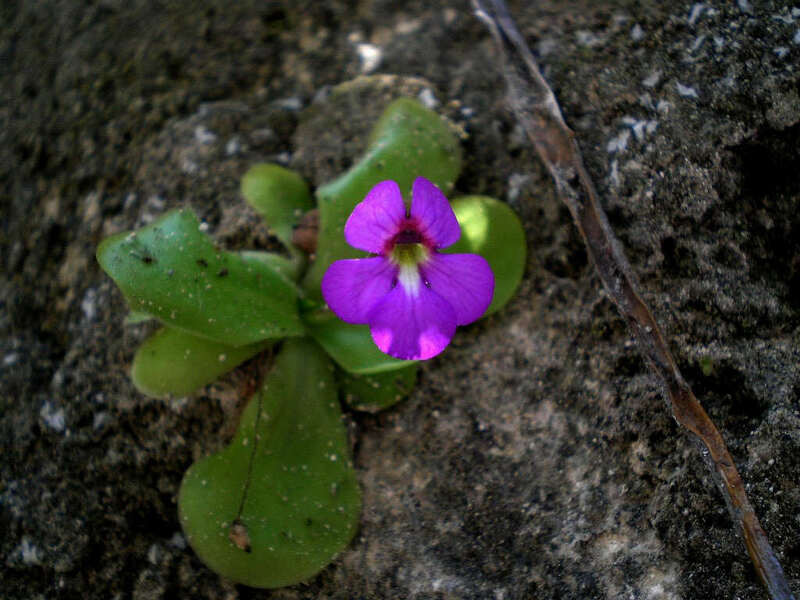 And thus we failed in yet another attempt to find the beautiful P.moctezumae in the wild. But while admiring the Moctezuma Canyon from above, we talked to some locals who gave us a really good tip on how to reach the canyon bottom in a very easy way… Well, maybe next weekend for Ruben & I, but unfortunately not for Noah & Forbes who had to return to California after 6 weeks traveling all around Mexico in search of Pinguicula. P. moctezumae : next holy grail of Fernando and Ruben. Will they found it ? Pinguicula moctezumae in the Botanical garden of Liberec (CZ). 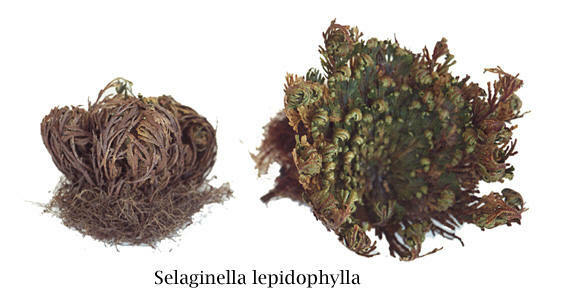 Note the Selaginella lepidophylla accompanying the plants like with P. elizabethiae.